Featuring Eloise & Company with caller Sonya Kaufman! No experience required: each session starts at 7:00 pm with a 30-minute lesson, and then dances are “called” from 7:30-10 (this means the steps are called out loud so you can follow along). All levels of experience are welcome. 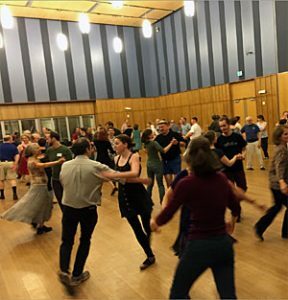 The Contra Dances are presented by Carpe Diem Arts in partnership with the Folklore Society of Greater Washington and Washington Revels, with support from BE ACTIVE: Montgomery County Department of Recreation.